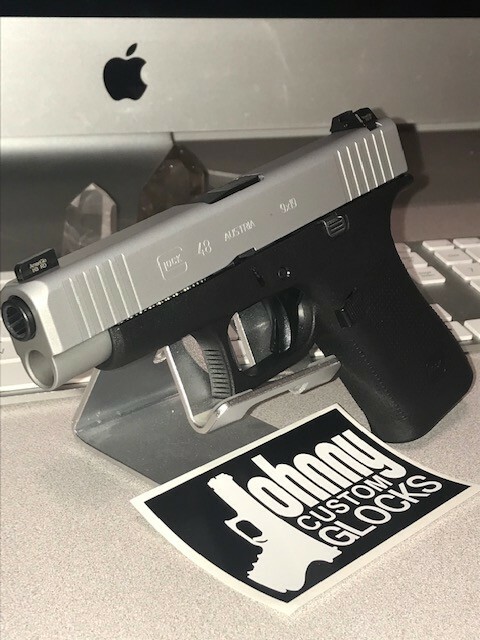 SIGforum.com Main Page SIG Pistols Glock 43/48 trigger shoe size. Anyone know if the factory G43/48 trigger shoe is the same size as other models such as a G17? Im talking about just the plastic shoe, not the whole trigger bar assembly. I want to know so I can remove the serrated shoe off of my 48, and install a smooth faced factory shoe from a 17. Is that possible? I would assume so, since aftermarket triggers( Apex and Vickers) are not model specific. Yes it should work. I installed this Apex trigger on my 48. I have a couple spare G17 triggers that I will use as donors. Yes, it works. G17 trigger shoe functions fine with a 43X/48 trigger bar. I ended up getting a pre-travel adjustable factory smooth faced shoe from Johnny Glocks. I'll probably get these for my other Glocks sometime. Thanks Nismo, I ordered one of those triggers. I'm curious if anyone has used the Overwatch Polymer DAT? The trigger on my G48 is hurting my finger. Yes, but on my G19. I got it mainly for the The pre-travel reduction for my short fingers, and for the price over their aluminum versions. I admit that I only put less than 500 rounds through it and took it out. I shot it just fine, but the flat face just doesn't feel right to me. I put one in my 43 and I’m very impressed with it. I find it feels much better than you think it might based on how it looks. It’s almost deceptive. But in my opinion it is a major improvement over the stock serrated trigger which I greatly disliked. I went with it based upon general good feedback here of Overwatch’s products and the price. I would do it again. Quick Reply to: Glock 43/48 trigger shoe size.